Ceramic Grease is a premium assembly paste and lubricant grease. Thanks to its unique formulation, the product has a very high temperature range (peak temperature approx. 1500 °C) and a high resistance to pressure. At the same time, it reduces the friction in the moving parts and provides effective protection against corrosion. 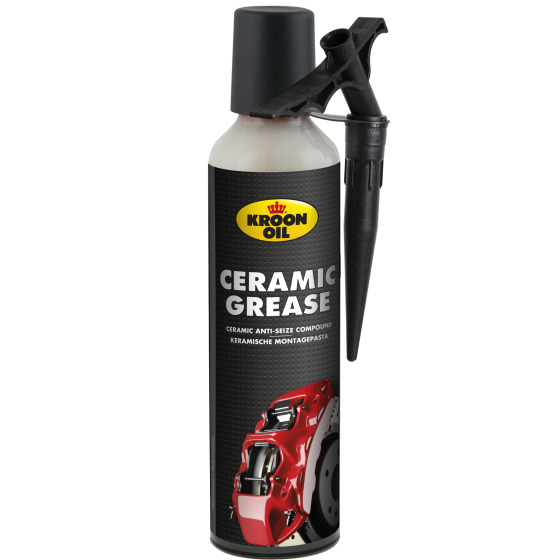 As Ceramic Grease is an assembly paste without metal particles, it also provides outstanding protection against electrolytic corrosion. This type of corrosion occurs when different metals come into contact with one another, such as a steel bolt screwed into an aluminium component. Without using a good assembly paste, the least precious metal (in this instance, aluminium) will be affected. Ceramic Grease is a premium assembly paste, particularly suitable for the assembly/disassembly of: ABS and ASR system components, brake parts, spark plugs (glow plugs), lambda sensors, exhaust parts, (bolt) connections, connections of different metals (e.g. steel/aluminium), a range of connections and flanges in industry and furnaces. Furthermore, the product is also suitable for components and applications exposed to very high temperatures and/or high pressures.